Today’s premiere comes to you from Cosmic Rhythm, a label based in the south of Italy that likes to wear it’s heart on its sleeve, as opposed to dwell is animosity and shadows. “Mystic Sounds, Black grooves, Atmospheric dreamy vibes and Natural elements are the essence…” states their Soundcloud page, and after listening to their latest release by Spiritual Emphasi, it’s clear that they hew as close to their own mission as any label could. CRM03, titled Spiritualism, is an absolute flexing of Cosmic Rhythm’s manifesto. The original mix of the eponymous first track serves as both an intro and a focal point for this EP. Militant snares and washed-out pads ground the track throughout, leaving tons of room on top open for the aqueous bass line to ricochet off it’s melodic and daydreamy counterparts. 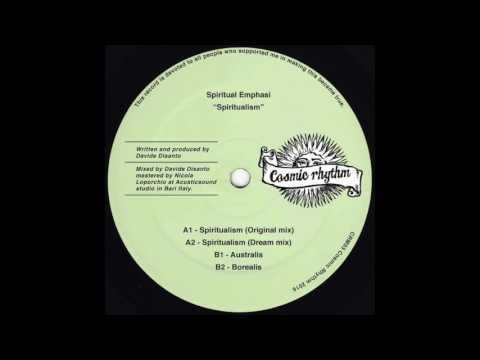 “Spiritualism (original Mix)” doesn’t feel as though its moving from any discernible point A to point B; rather it’s simply meandering about it’s environment, soaking up and reflecting back every bit of light and ambiance it comes in contact with. The rest of the EP continues on in this fashion; the “Dream Mix” of our premiere spends much of its run revolving around the delicate mixture of the ingredients that made the A1 so attractive; a twinkling high-end, and effortless, bouncing bass line combine to great affect here. The flip-side showcases what happens when the Spiritual Emphasi project steps out from under the bright blue sky and into the dark of night—Australis holds on to a steady and jacking 4×4 rhythm, pumping out floor-ready escapades on top of increasingly trademark padwork, and the closer, Borealis, has a truly moonlit quality to it, with traces of melancholy washing over and weaving through from start to finish.